So I was off yesterday, right...and I drove my mom to an appointment she had in Jalan Sultan Ismail. This is like, really amazing...cause I discovered there are things in Kuala Lumpur I've NEVER seen before. And after over a decade being acquianted with the weirdest, quirkiest, strangest and absolutely freakiest of the city....I found that I CAN still come across something new. So you've heard of basement parking...and multi-level parking...dig this. My mom's appointment was in Wisma KFC in Jalan Sultan Ismail. When we got there, I drove about trying to find an entrance to the parking area. The only entrance I could see was to the basement parking. 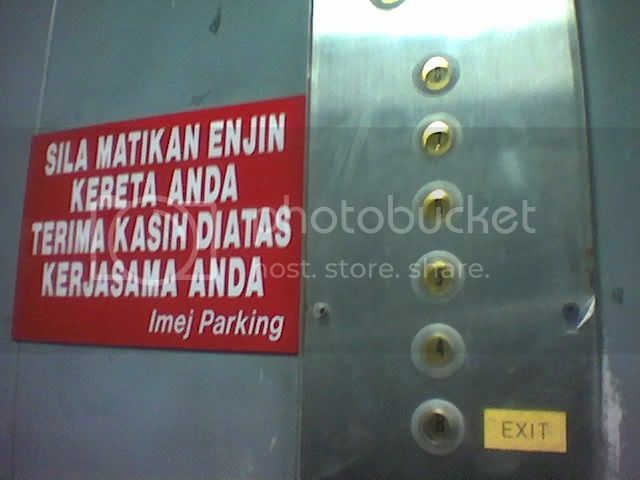 However, there was also a big sign there that stated it was only for season parkers, and that visitors parking was only on the fourth floor. Whizzing about and finally ending at the exit. 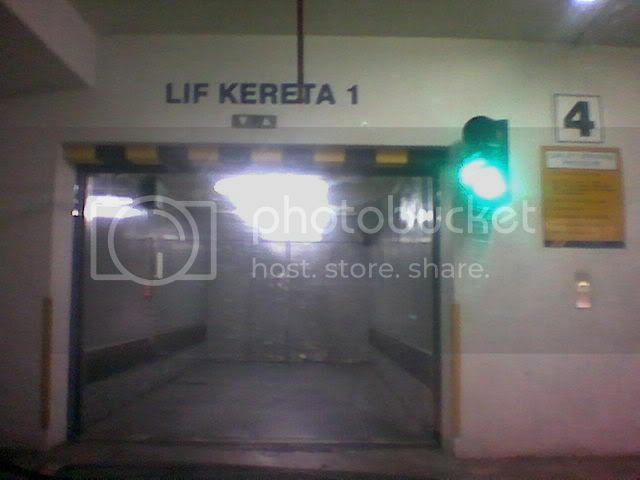 a security personnel directed me to what looked like a loading bay entrance. Strangely enough, the 'entrance' which was just enough to fit a car, looked like a huge oven, you know the type they 'bake' cars in after a paint job...either that or a really small garage. Apparently, it was an ELEVATOR! A lift big enough to fit just one car. Which was supposed to take us to the fourth floor. There were two lifts with one for heading up, and the other for heading down. Weird. And very James Bond-esque. For those of you who have seen it before, nevermind. For those of you who haven't...check it out! 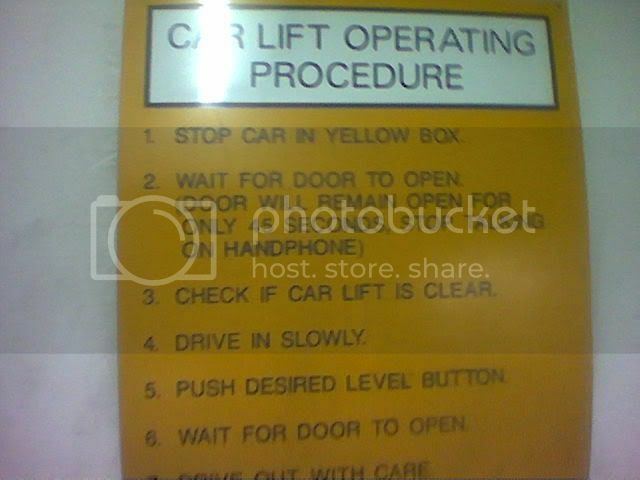 Proof of the car elevator. One for the Zahid fans. 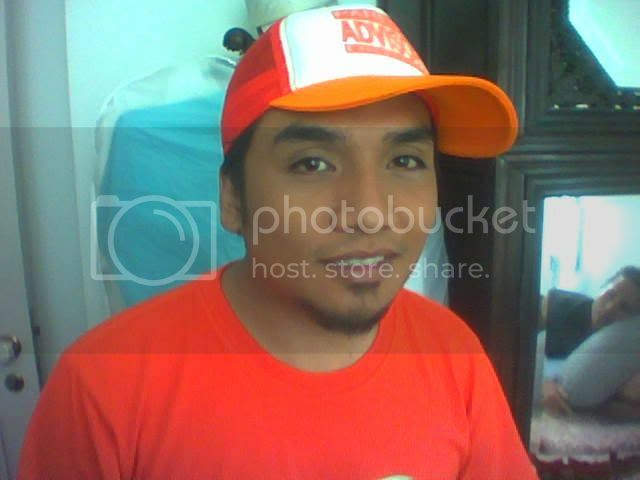 This pic was taken by my friends' Nokia 6600 during the shooting of the Akademi Fantasia teledrama they were shooting I think last month..